Peugeot iOn on lease-only deal | What Car? 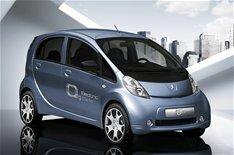 The Peugeot iOn, the small four-door, four-seat electric car will be available only on a leasing deal. For 498 a month, when the new 20% VAT rate comes in next January, users will get the car and batteries with full warranty cover for a period of four years or 40,000 miles. All maintenance costs are included, and from next April a GPS-based emergency accident and breakdown rescue service will also be part of the package. Early adopters are expected to include government departments and local authorities, car-sharing schemes and energy companies. The iOn is made for Peugeot by Mitsubishi, which sells a similar car in the form of the i-Miev for 28,990 (for a limited run) before Government grants. Citroen will also have a version to be marketed as the C-Zero. Peugeot has given the iOn's interior a more European flavour than the i-Miev's and also modified the electric powertrain to increase the driving range on a full charge by 30%. It has achieved this by increasing the amount of battery charging that occurs when decelerating or braking. The car's maximum range is quoted at just under 100 miles, although Peugeot admits this can be halved by hard driving or excessive use of power-sapping features such as the air-conditioning or heating system. Recharging the lithium-ion batteries takes six hours, but a quick-charge system can restore them to 80% of capacity in 30 minutes. Although the leasing costs are expensive for an electric supermini, Peugeot claims the potential savings in fuel and parking costs compared with a small petrol or diesel car could amount to 4000 a year. This will be increased by a further 1700 for users who drive into and out of the London Congestion Charge zone.